During the month of February Trinity Episcopal Church, 119 Forest Avenue, Cranford, New Jersey, will be raising money and collecting goods for Seamen’s Church Institute (SCI). Please drop off the following at the church: Trial-size shampoo, 2-4 oz. bottles of hand lotion, lip balm, soft pack of facial tissue, packs of chewing gum, and microwave popcorn, for SCI’s ‘Christmas at Sea” program. “90% of everything consumed is brought in by container ship, said The Reverend Andy Kruger, Trinity’s Priest-in-Charge. “Christmas at Sea supports the merchant mariners who spend 6-8 months at sea aboard cargo freighters,” Father Andy continued. For additional information call 908.276.4047. The Seamen’s Church Institute (SCI), founded in 1834 and affiliated with the Episcopal Church, is the largest mariners’ support agency in North America. It provides professional mariners with specially tailored education, free legal advocacy for mariner welfare, and pastoral care. 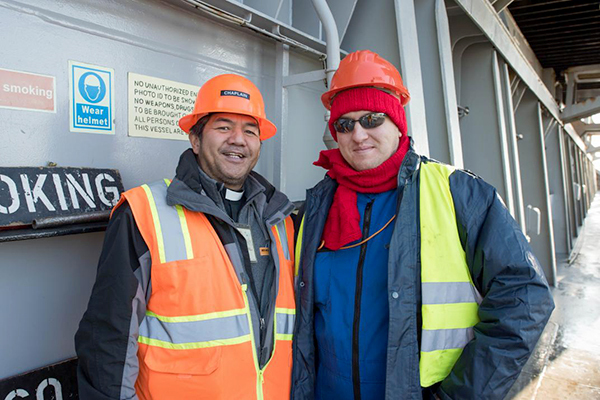 It operates Seafarer Centers in Port Newark, the Port of Oakland, Houston TX, and Paducah KY. Its Chaplains visit over 3,400 vessels a year. The Seafarer Centers provide mariners and port workers with internet access and PCs, International calling and cheap phone cards, recreational activities, worship and pastoral care regardless of their religious affiliation, and free shuttles from terminal gates to the center and local stores. Mariners are the backbone of global commerce, and the Seamen’s Church Institute proudly supports hardworking people who make our modern way of life possible. For more information about Seamen’s Church Institute visit seamenschurch.org or call 973-589-5828. (above) Seamens Church Institute Chaplain onboard with crew member.